Hennessy, William Fry, BNP Paribas, Colourtrend, Bank of America were among the winners in 11 categories at the 27th annual Allianz Business to Arts Awards ceremony at the Bord Gáis Energy Theatre tonight. This year’s Allianz Business to Arts Awards, attracted a high levels of entries, increased regional activity and long-term partnerships that continue to evolve through diverse activation campaigns. Over €13m spent on arts sponsorships submitted. 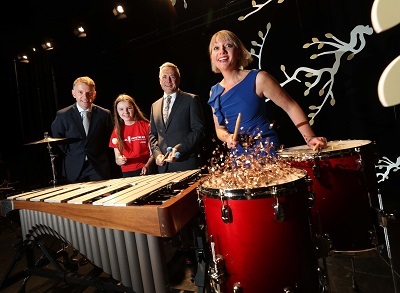 The Awards recognise businesses, artists and arts organisations that develop creative partnerships and bring businesses and the arts into mutually beneficial relationships across society. The evening was a celebration of the most innovative and creative partnerships in Ireland in 2017/2018. Leading the congratulations among over 500 business and arts leaders at the theatre was Minister for Culture, Heritage and the Gaeltacht, Josepha Madigan TD. “The 30th anniversary of Business to Arts as an organisation this year gives us even more reason to celebrate. As partners of the Allianz Business to Arts Awards for 18 years now, we have seen how this process of arts and business collaboration has enriched us in ways you cannot measure. Ireland has changed beyond recognition. In that time, and even now, the one constant was the arts’ contribution in helping us better understand our cultural identity and how it helps Ireland thrive in challenging times. 2018 marks the 27th anniversary of the Allianz Business to Arts Awards, which recognise businesses, artists and arts organisations that develop and sustain creative partnerships. The awards recognise large, mid-sized, small and long-term sponsorships, staff engagement activities, commissioning, corporate social responsibility programme, community engagement and portfolio-based partnerships. For the 27th anniversary of the Allianz Business to Arts Awards, the awards sculpture once again has been commissioned by daa. This year’s sculpture was created by Dublin based artist Ed Miliano. Ed took inspiration for ‘Shine’ from the skyline he passed by in Tokyo on the way from his home to his studio. A sun, imagined as a cut-out circle, rises above the city and sheds light, allowing light and creativity to flow through the city.